How bad was the deception? First of all, in order for this all to make sense, the children had to have what is known as “regressive autism”. In other words, they had to have been fine — normal, in fact — and then get much worse after the MMR shot, developing autism. Children who obviously weren’t right from the start would have had something wrong already, and not have autism caused by the MMR vaccine. In Wakefield’s paper, he described 9 of the 12 children as having regressive autism. Mr. Deer’s investigation found that three of the 9 children he reported as regressive autism were not. Moreover, an additional 5 of the remaining 6 could not be proven to have regressive autism. So — at best — only 6 of the 12 children in the study had regressive autism; more likely, only one did. Next, Wakefield’s paper alleged that a colitis brought on by the vaccine is what led the shot to become so damaging. In his paper, he reported that 11 of 12 of the children had a nonspecific colitis. What did the records show? That only 3 of the 12 had nonspecific colitis. The other 6 cases were falsified. And, of course, the final piece of the puzzle was that symptoms needed to start not long after the vaccine was given. In Wakefield’s paper, 8 of the 12 patients reported symptoms days after the MMR. Mr. Deer’s investigation confirmed that for 10 of the 12 children, this was false. For the other two it was unknown. So — at best — 2 of the 12 children showed symptoms near the vaccine. At worst, none did. Measles has surged since Wakefield’s paper was published and there are sporadic outbreaks in Europe and the U.S. 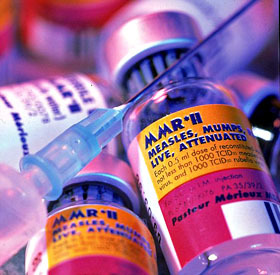 In 2008, measles was deemed endemic in England and Wales. The vaccine-autism quackery that Jenny McCarthy and her ilk continue to promote isn’t just harmless fun and games. It’s damaged untold children and might well have killed a few. It’s long past time for it to stop.